I'm a current Google Pixel user and there's nothing I love more than stock Android. But my most anticipated phones of 2017 are the Samsung Galaxy S8 and Samsung Galaxy Note 8. Yes, even after seeing what became of the fire-prone Samsung Galaxy Note 7. Some may be reluctant to ever buy a Samsung phone again, as the South Korean electronics giant finally disclosed that it went forward with a too-big battery in the Note 7 and, well, you know the rest of the story. But I'm more than willing to give Samsung another try thanks to how it fought the Note 7 fire with transparency – a move that could bode well for uneasy customers. Here’s why I think the company is in a good position to get back on track. Coming off of the damning last few months wherein Samsung disappointed loyal fans, faced a brand-tarnishing ban across the US (it’s straight-up illegal to carry a Note 7 on a plane), and lost a ton of money, it finds itself in a unique situation. It has to prove itself all over again. Sure, smartphone companies constantly have to climb a steep hill to prove something to their respective fans, that they are better than the rest with each new phone. But none have found themselves in Samsung’s dire situation. For Samsung, everything is broken. Not just the phone in question, but the quality analysis process that somehow allowed the time bomb to pass through certification, and finally, the trust between Samsung, its fans and retailers, which were each burned by the Note 7 (albeit in different ways). The Samsung Galaxy S8, a phone that has to fly incredibly high to recover lost profits for the company, will inevitably be under intense scrutiny when it launches this Spring. All of this sounds negative, but to my optimistic mind, Samsung is in an advantageous position right now. It has an opportunity to reinvent its image and create a device that rights the wrongs for the consumer, whose collective trust was damaged most by the Note 7. Early on in the Note 7 situation, Samsung bridged the communication gap with its customers to offer apologies, but it wasn’t until the company’s post-mortem conference that answers could be provided. 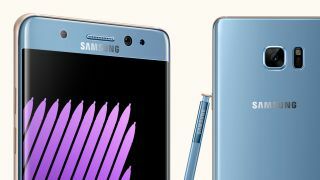 It touched on what caused the Note 7’s explosive tendencies and then gave a look into how it plans to overhaul its quality analysis process moving forward with an 8-point battery safety check that it will now employ on all of its smartphones before they are released. TechRadar’s Global Phones Editor Gareth Beavis thinks that this new plan is a good step for future phones and I agree. The company’s about-face efforts in the battery department is obviously an act of damage control, but it could work to become a selling point for Samsung phones. And I think that’s a great thing for the consumer who wants to trust in their new hardware. Transparency like this, even if it comes late and at the cost of the behind-closed-doors mystique that many tech companies try to maintain, is a good thing for Samsung right now. Let us not forget that before the Note 7’s battery situation, Samsung was on quite the streak with its recent smartphones. Looking back to our review of the Samsung Galaxy S7 Edge, we boldly claimed that it was the best smartphone in the world. And even the ill-fated Note 7 scored really well with us. So, coming off of all the inescapable negative publicity from the last few months, Samsung is probably very keen to double down on its efforts to make the next devices really stick out and deliver. If the rumors are true, the Samsung Galaxy S8 will be the first smartphone to feature the Snapdragon 835, a truly next-generation chipset by the sound of it. This, along with solid spec list, high-performance battery and a design to rival or exceed the iPhone 8 when it releases will do wonders in burying the last few disastrous months. The Note 7 obviously put a major dent in Samsung’s reputation and its wallet, too. But if it sticks to its new and improved testing methods and focuses on making truly killer devices that consumers want and need, you’ll probably find me in line for whatever comes next and I’m certain that other consumers who felt wronged will come back, too.